Ohio operators now have the option to achieve Ohio EPA certification in part by testing through the Professional Operator certification program. The convenience of examinations available six days per week at seven locations in and near Ohio offers an accelerated path to Ohio EPA certification.In certain municipalities and union contracts, Ohio operators may receive additional compensation for acquiring and maintaining multiple certificates. Obtaining a PO designation and certification may qualify an individual for additional compensation. Please check with your supervisor and/or union representative to see if you are eligible for additional compensation. Operators interested in working outside of the state of Ohio will also benefit from the wide-spread acceptance of the ABC/C2EP standardized exams administered through this program. 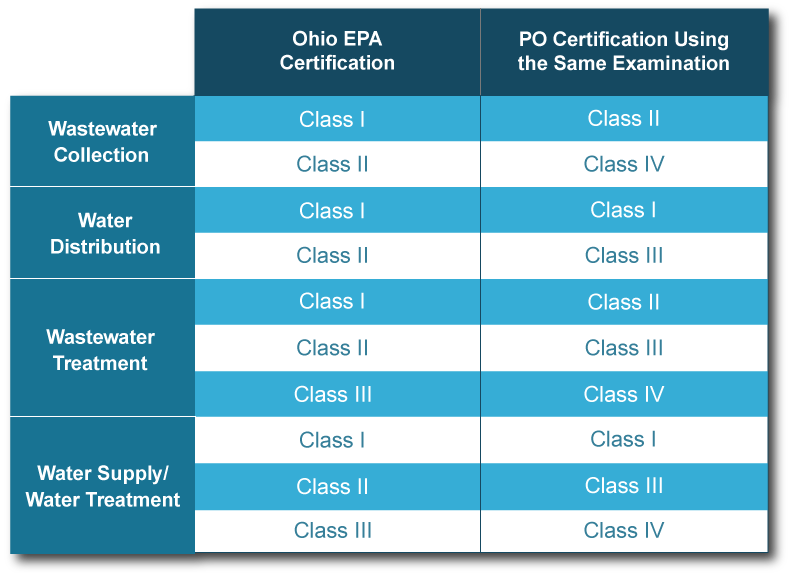 Review the chart below to verify which PO exam is approval for the Ohio EPA certification you are seeking. Once you’ve identified which PO certification is right for you, review the eligibility criteria for the program to determine whether you qualify. Assemble your documentation and complete your application online through the PO Certification Portal. C2EP will review your application within 30 days of receipt; you will be notified if any additional information is required to approve your application. Once your application is approved, you will receive an exam scheduling notice from AMP. Follow the directions on this notice to schedule your exam. Once you have satisfied all eligibility requirements and passed the appropriate exam, you will receive an ABC/C2EP Certification. Submit your examination results, Ohio EPA application for certification, and applicable fees to Ohio EPA.